There was a time when I would toast up a Tyson Chicken Patty and a bun and dab a little mayonnaise on there but those days came and went like compressed chicken product should. And mayonnaise isn’t alone. I don’t like ketchup either, except on meatloaf. That is the only time the sweet tomato concoction passes these lips. I, my friends, am a mustard girl. I’ll stop the condiment confessional and get to my point. 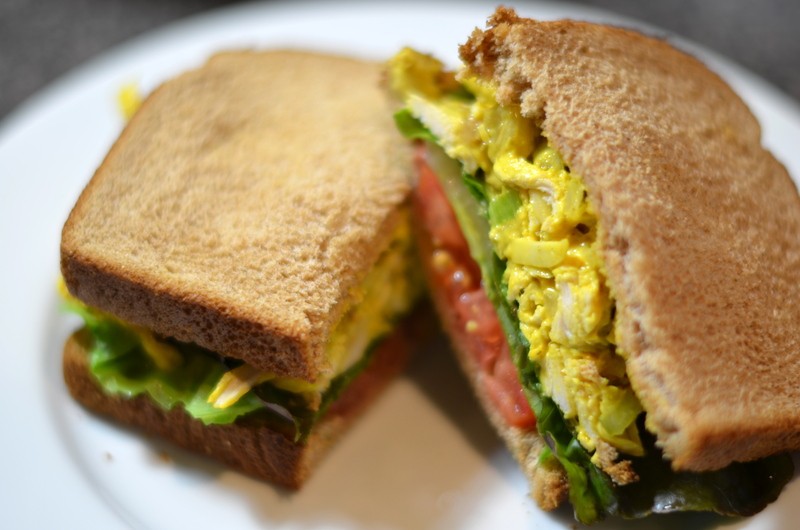 I never really liked chicken salad or thought about making it because of my aversion to mayonnaise. Until this decade. 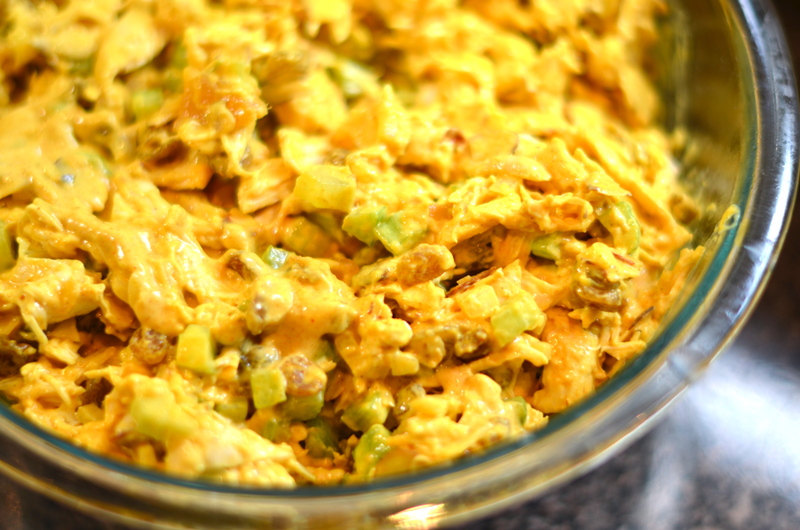 Now, one of my favorite things out there is some good curried chicken salad. It can be hard to come by because people doctor it up with some weird stuff, so I decided that I needed to take things into my own hands/mouth. And in an ironic twist, not unlike the end of an M. Night movie, this recipe doesn’t even call for that much mayonnaise! What? When I went to the farmer’s market this week, their chicken saw was on the fritz (who can’t relate to that?) and so I had to buy two whole chicken breasts rather than 4 split ones. It’s all the same so get what you can find. 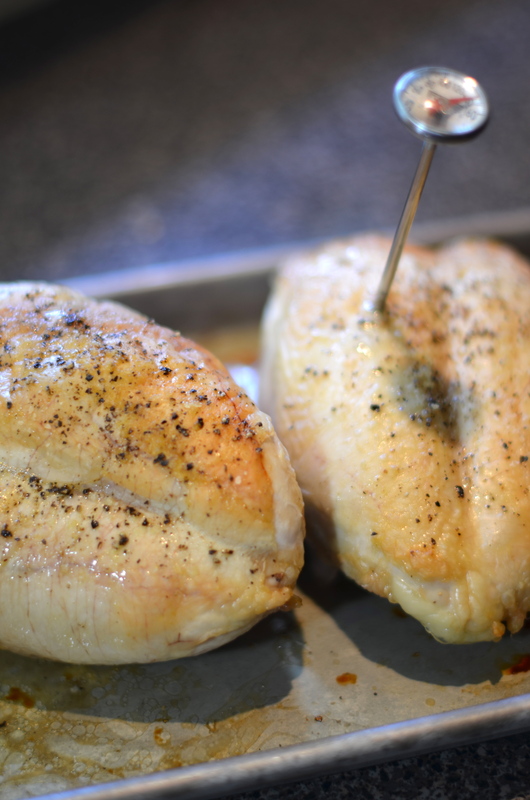 Preheat your oven to 350°F and lube up your chicken parts with a bit of olive oil, salt and pepper and place on a sheet pan. Roast until a thermometer reads 165°F – about an hour. Once your chickens are cool, pull off the skin and pick the meat off the bone. I enjoyed a nice chicken skin treat during this process but you may be less of a chicken fat/schmaltz kinda person. I can’t imagine. I wish Santa would bring me a stocking full of crispy chicken skin sometime. I decided to add the chicken, celery, onion, raisins and almonds to one bowl and then make a sort of dressing to pour over so I could test the recipe as I went. Most of my made-up cuisine is less precise than this, so I had to be prudent. I think it ends up being the best idea though so you can really mix everything evenly and then add to your chicken. Mix the yogurt, mayonnaise, curry powder and chutney in a small bowl and if it looks a bit thick to you, loosen it up with some milk until it’s the texture you like. Season with salt and pepper. 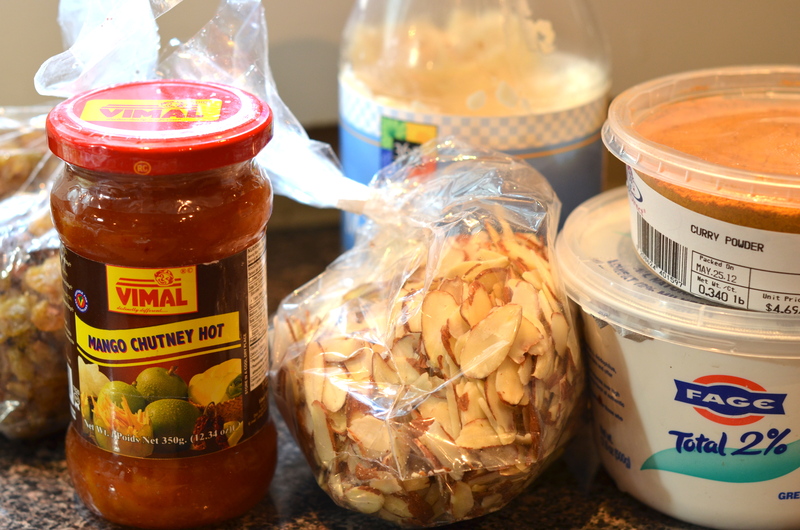 *If you can’t find chutney, I think that apricot preserves and a bit of cayenne pepper would do the trick. Let me know if you try that and what you think. Mix everything together and let sit in the fridge for a couple hours before eating if you can. 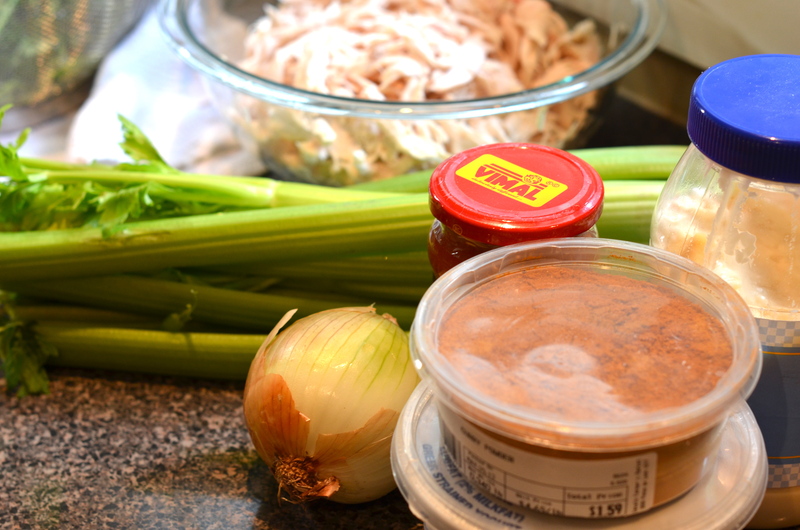 Summer is salad time in my mind, so I think I’m going to be expanding my chicken salad repertoire in the next couple months. This would be great on French bread or in a pita. I had whole wheat bread and that worked too. One last tip – save your chicken carcasses that you picked and put them in the freezer for the next time you want to make chicken stock. Enjoy! Hey lady! 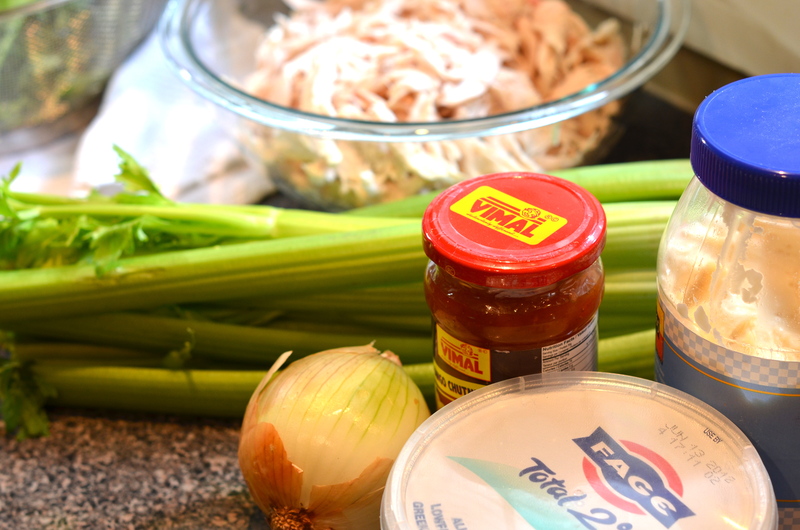 This sounds delicious – I love a good sweet/savory chicken salad. Question – in the ingredient list you have cumin listed, but in your photo and in the instructions you show/mention curry powder. Do you use both, or does cumin mean curry here (you know, figuratively speaking)? CURRY POWDER! That’s what happens when I blog early in the morning. Thank you for catching that – I’ll change it! Miss you and need suggestions of places to eat with the extended family in Kennesaw/Marietta. Can you help? Oh no. I can’t do mayo. Or kethcup. On anything. Unless it is a cheeseburger. Then there can be a little kethcup. But, no mayo. I use greek plain yogurt for chicky/egg/tuna salads.